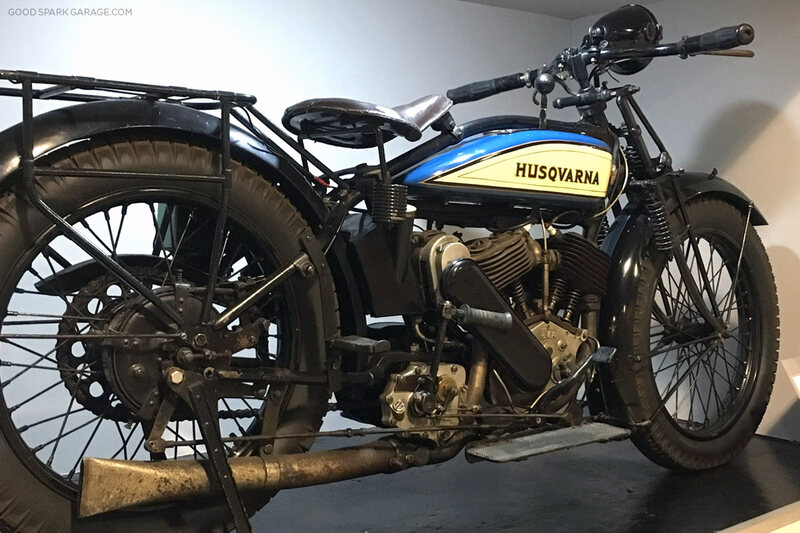 The oldest Husky we’ve seen in person, a 1925 500cc Twin. We pulled up early on a Friday morning and were welcomed by the guys at Moto Europa (see pics at bottom). They let us shop around and gave us a quick overview of the area; even told us about the International Photography Hall of Fame that’s connected to the same building (worth a stop for sure). 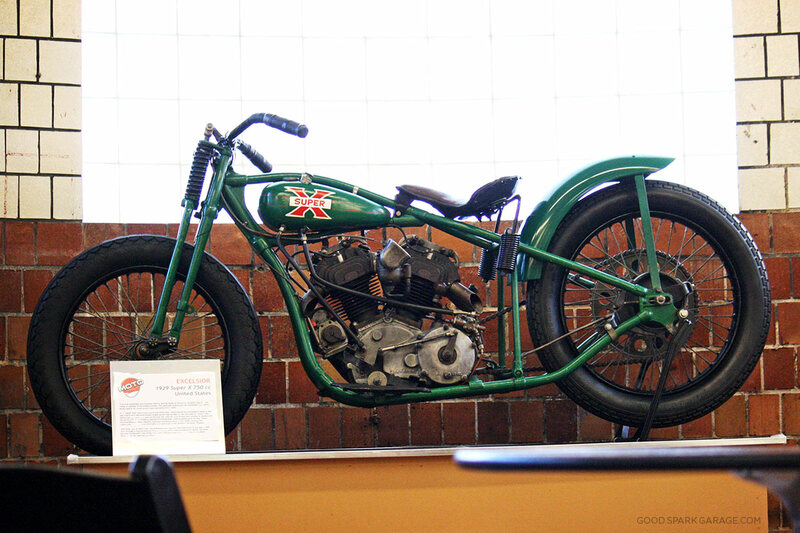 Outnumbered by European bikes, we still wanted to include this 1929 Excelsior Super X. 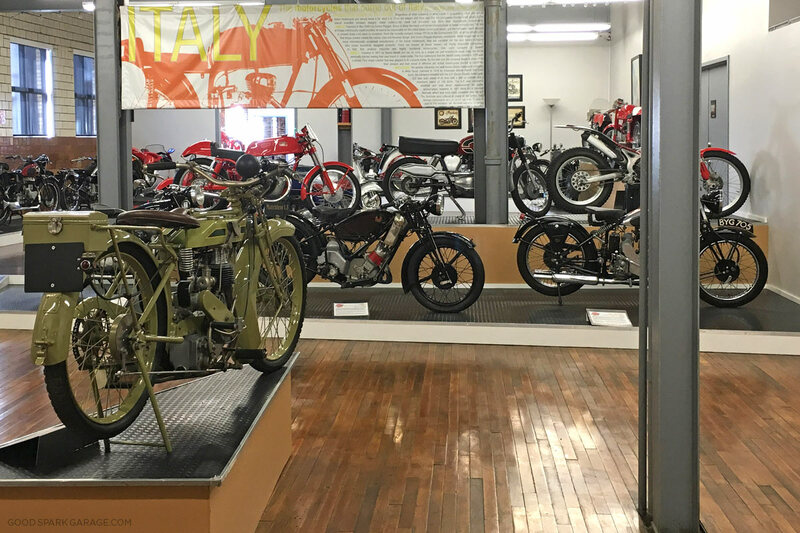 We bee-lined it over to the Moto Museum to take in its eclectic European collection. 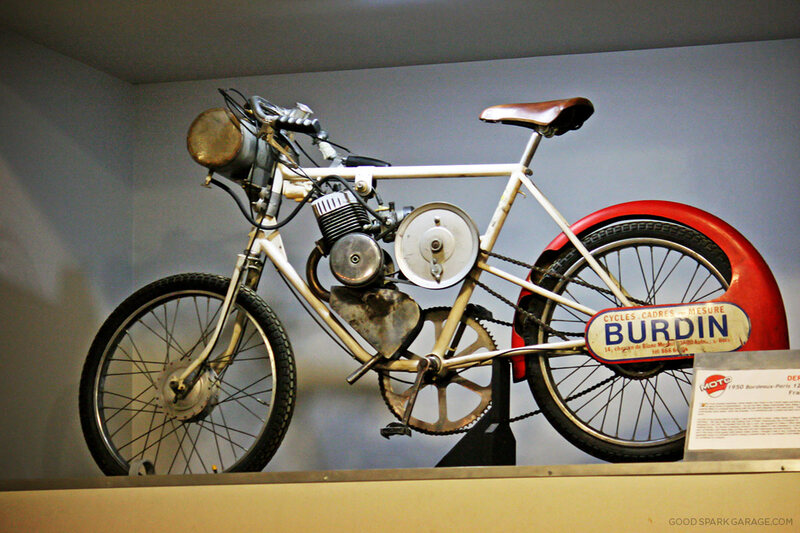 It was clear the collector/curator (Steve Smith), had an eye for unique machines with interesting provenance. Sitting in an old industrial building, this would be a great place to host a creative event or banquet (which they offer). There were bikes we’ve never heard of and, believe me, we’ve spent a lot of time poring over old books and magazines. 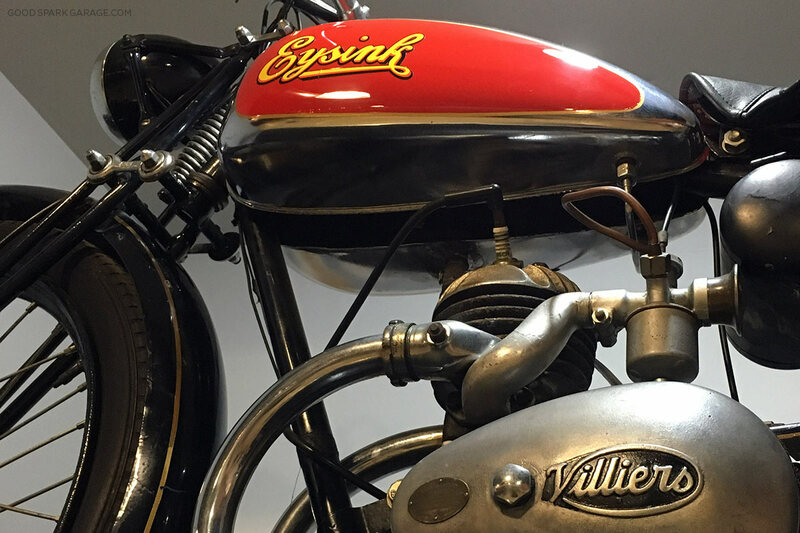 One example, pictured above and below, is a 1938 125cc Eysink (Dutch) motorcycle powered by a Villiers engine. On this Friday, it was a quiet morning, perfect for a non-rushed, self-guided tour through the old wooden-floored rooms. 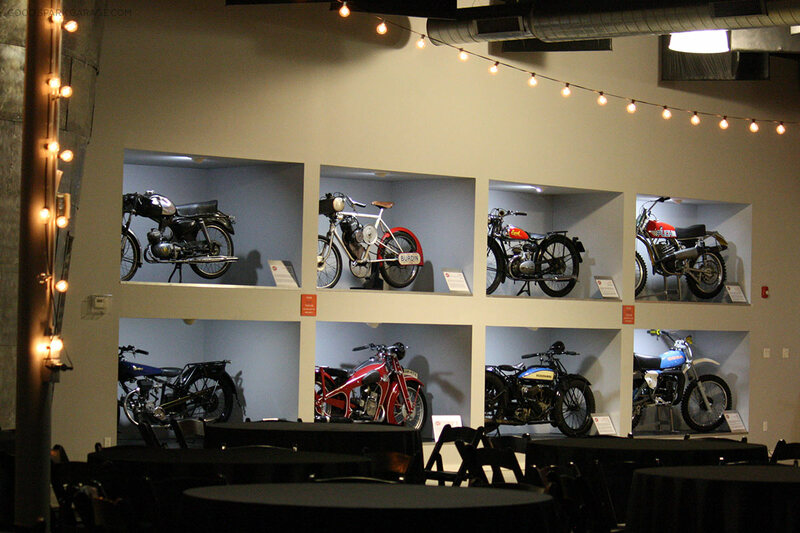 Each bike had elements that clearly earn their Moto Museum-worthiness. 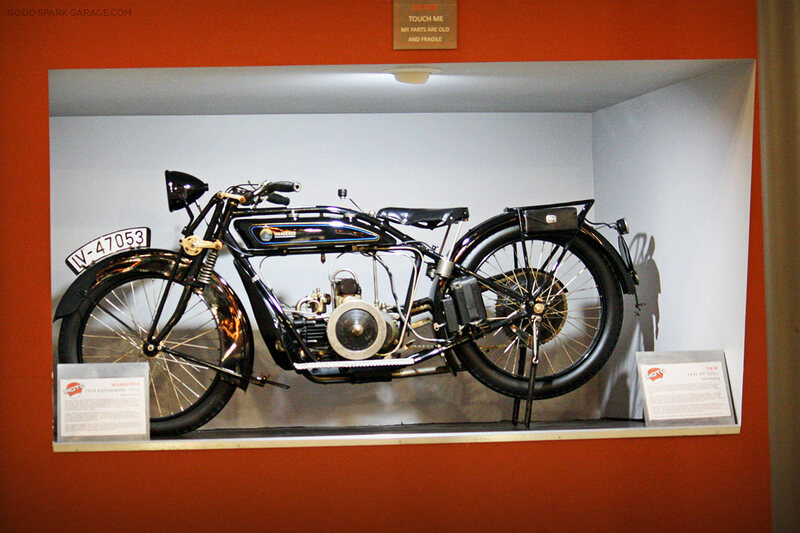 1933 DKW E300cc (Germany). 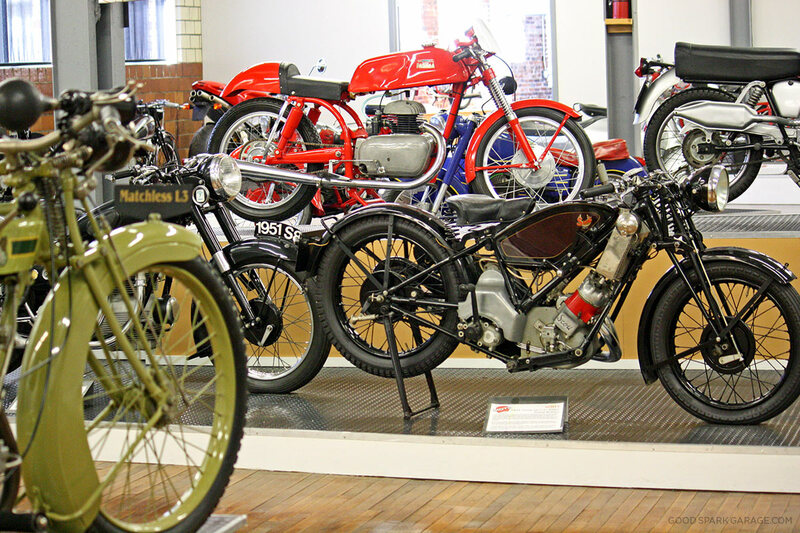 In the 1920s, DKW was one of the largest motorcycle manufacturers in the world. 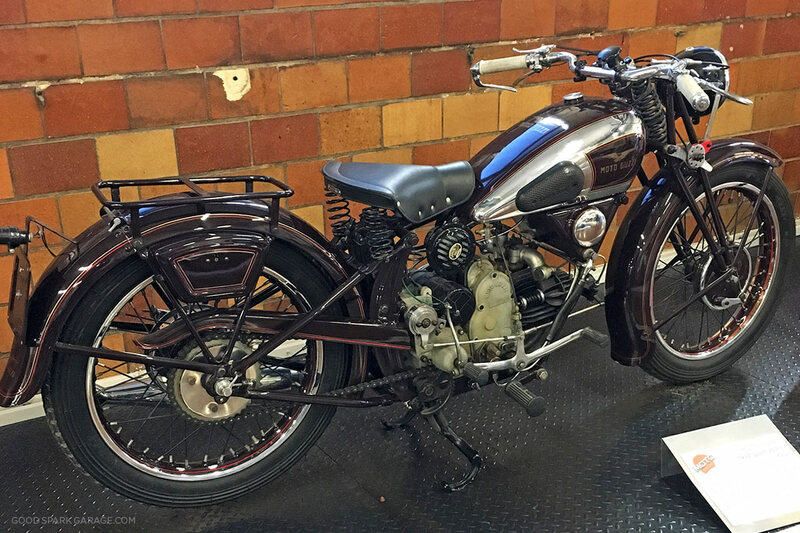 This 1949 Imme R100 (above) originated in Germany. Its rear wheel is supported on one side with the exhaust pipe! Also, check out that single-sided front “fork”. We almost didn’t share this pic because of poor image quality, but these interesting aspects are too cool not to share; like the fact that the rear wheel and engine move as a unit. 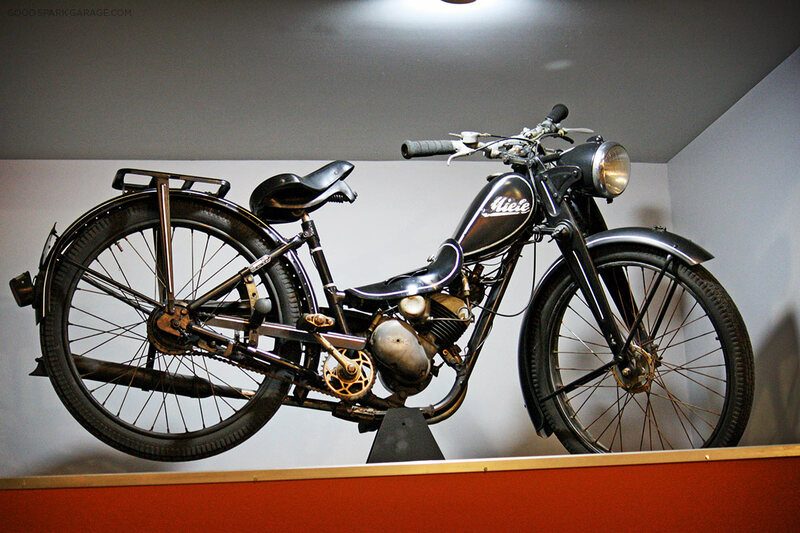 1950 Derny 125cc from France; a velodrome racer. Such a creative space with its mixture of old, original structure and new compartmentalized displays. We love how the wood, concrete and metal were kept as part of the aesthetic. 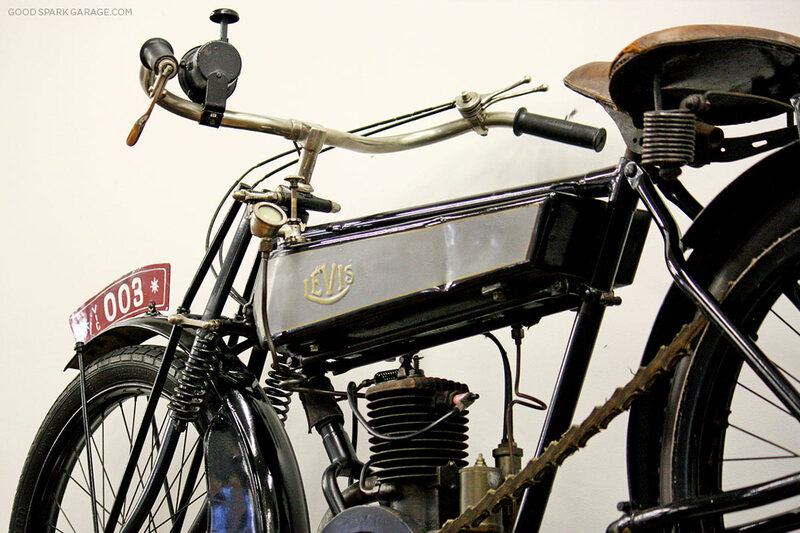 This British 1920 Levis “Popular” is powered by a 211cc 2-stroke. Didn’t know Maserati made motorcycles? Neither did we. 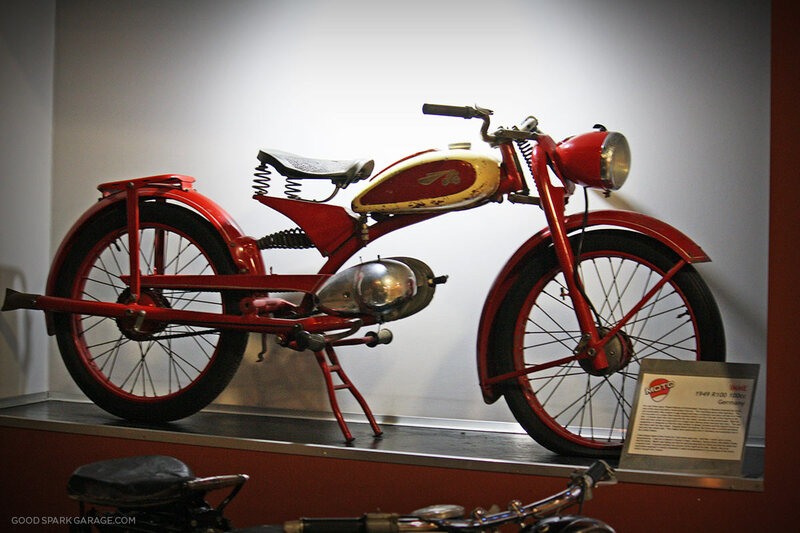 Pictured above, this 1956 Maserati Corsa 125cc was one of many bikes manufactured by the brand from 1956-1961. Miele made this step-through 100cc model for women in 1951 (Germany). 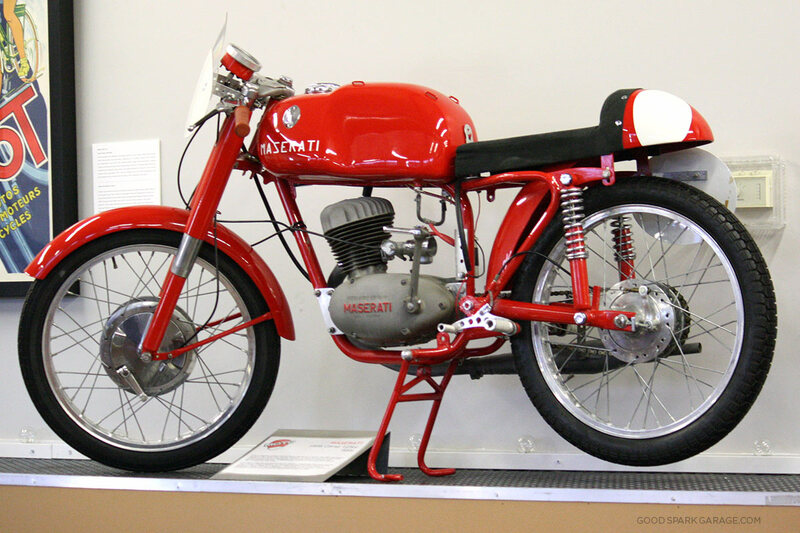 A 1963 MZ ES150 (East Germany). 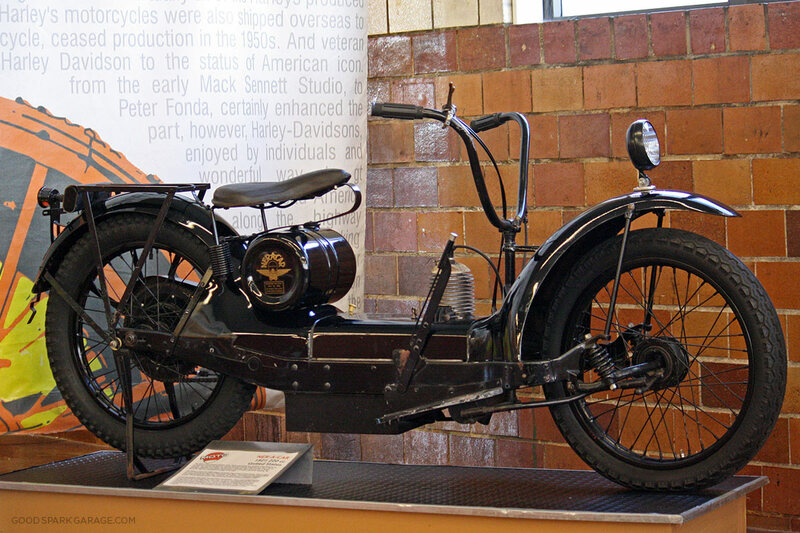 The handlebars moved separate from the headlight. 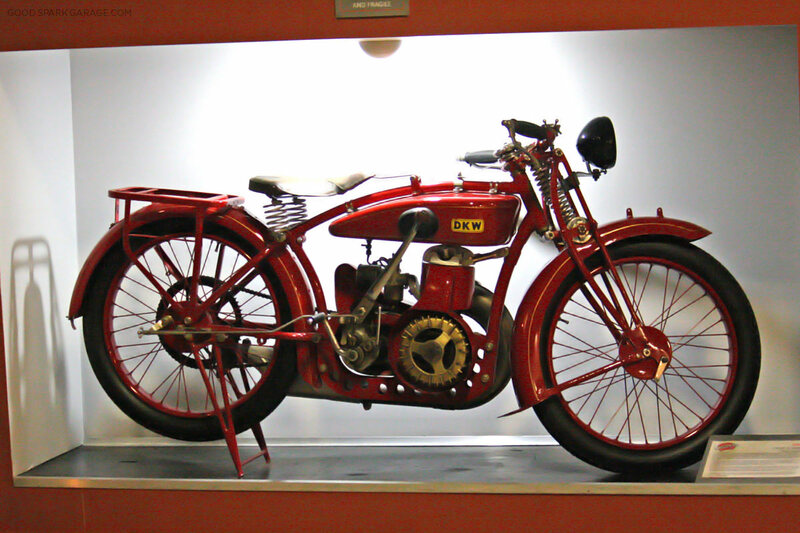 Another American bike in the collection is the 220cc, 1921 Ner-A-Car. 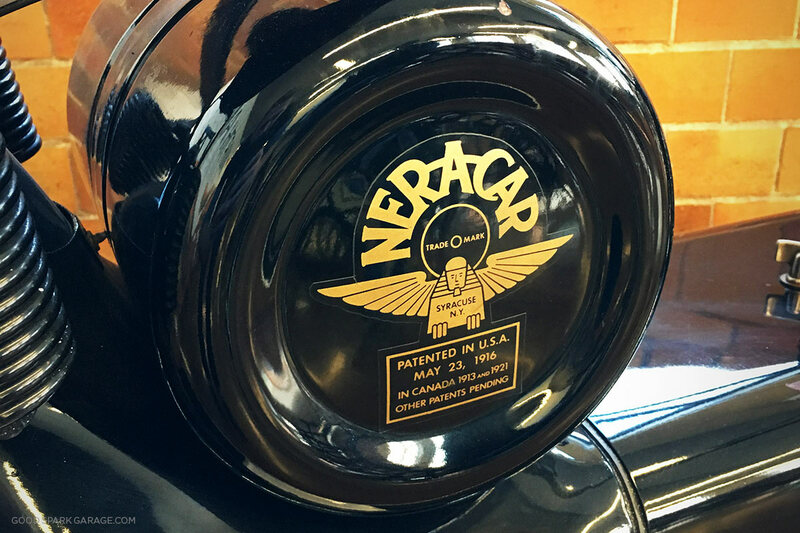 Though it didn’t catch on well in the States, it featured an innovative hub-center steering method. 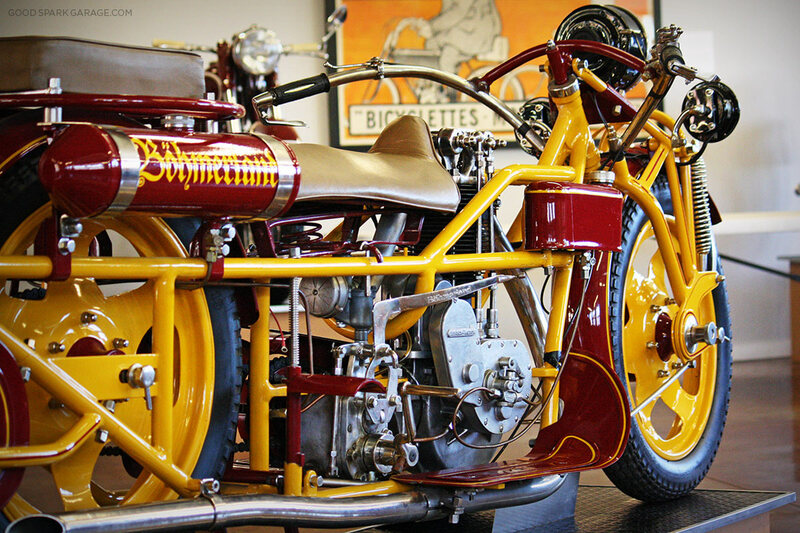 This fine example of funky early motorcycles belongs to a friend of the museum. 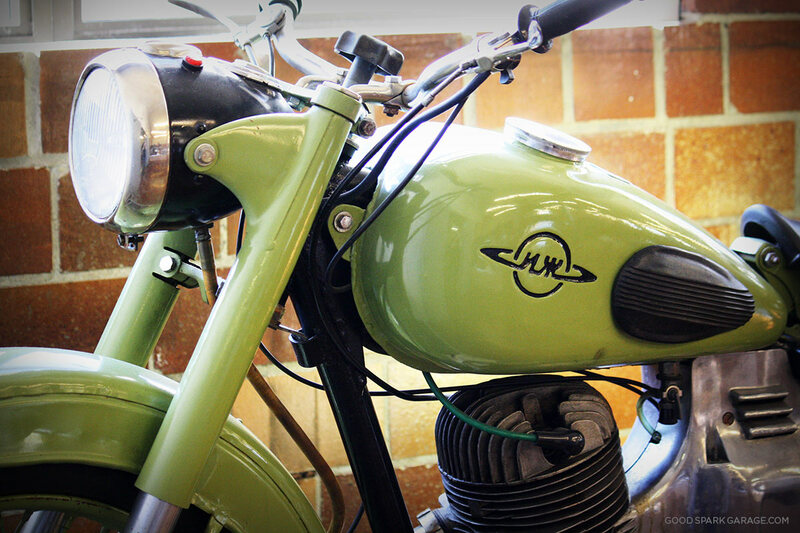 A 1961 IZH IZ-56 (350cc) from the Soviet Union. 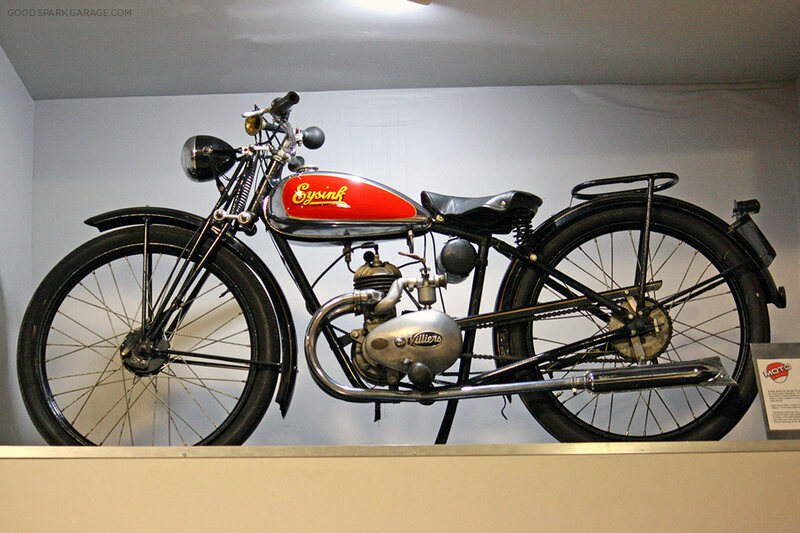 This bike (above) is a 1928 Wanderer “Kaffeemuhle” 185cc model from Germany. It features an exposed flywheel and tank-mounted shifter. 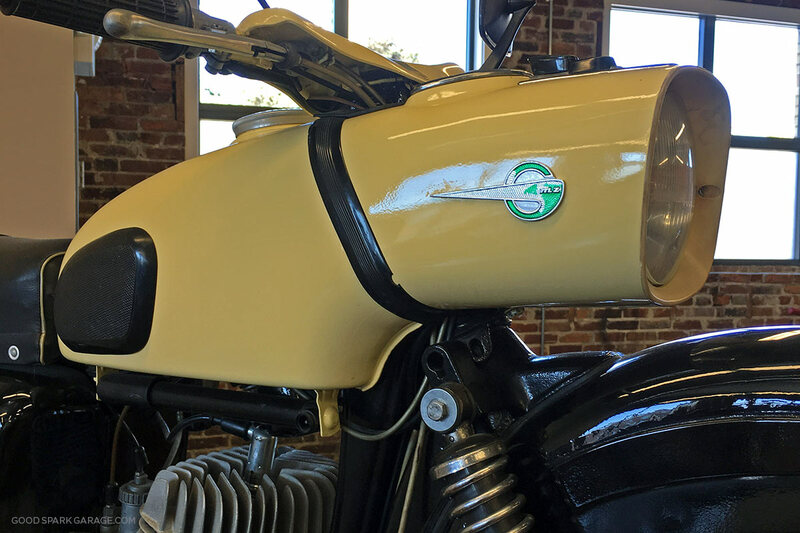 Interestingly, after a Czechoslovakian company bought the Wanderer, it became known as the Janecek Wanderer, which then was shortened to form a well-known moto brand that’s still around today: Jawa. 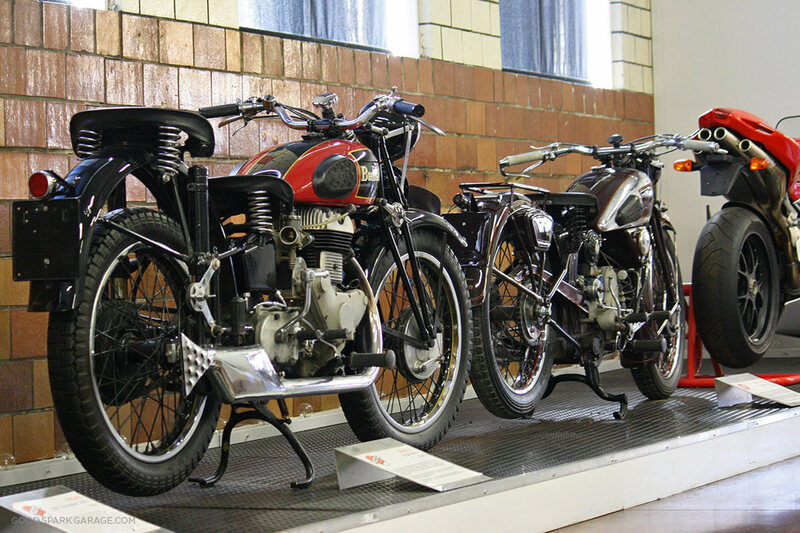 The old bikes were certainly a treat to study up close. 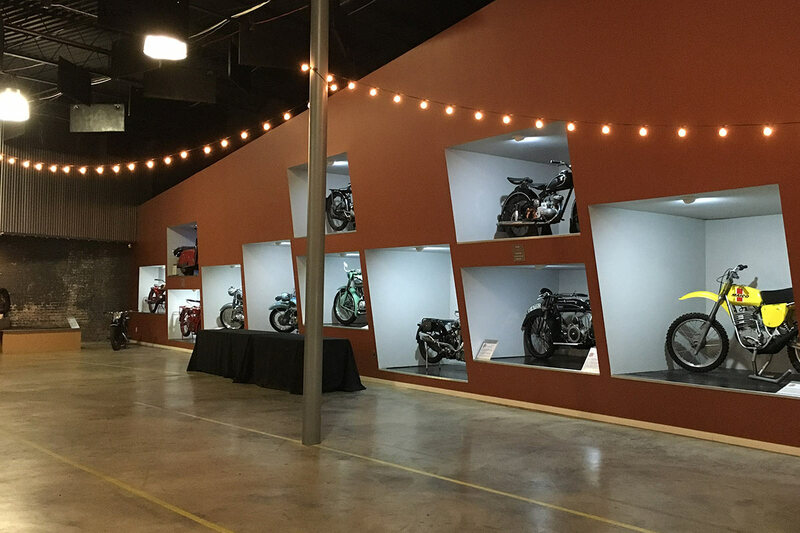 We tip our helmets to Steve Smith, who willingly shares his collection with us fellow gearheads and motorcycle fanatics. He found a way to build a career that allows him to pursue his hobby to the extreme. 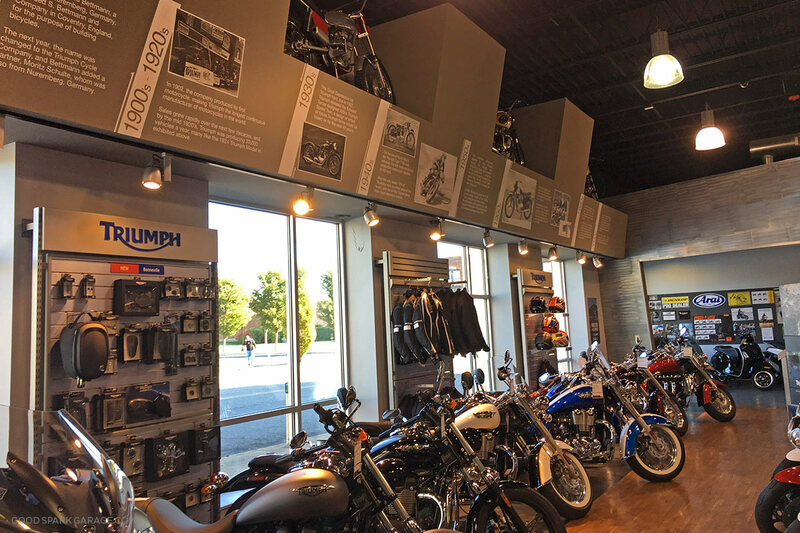 Thankfully, it’s a hobby that motorcyclists can actually experience a large part of in St. Louis. 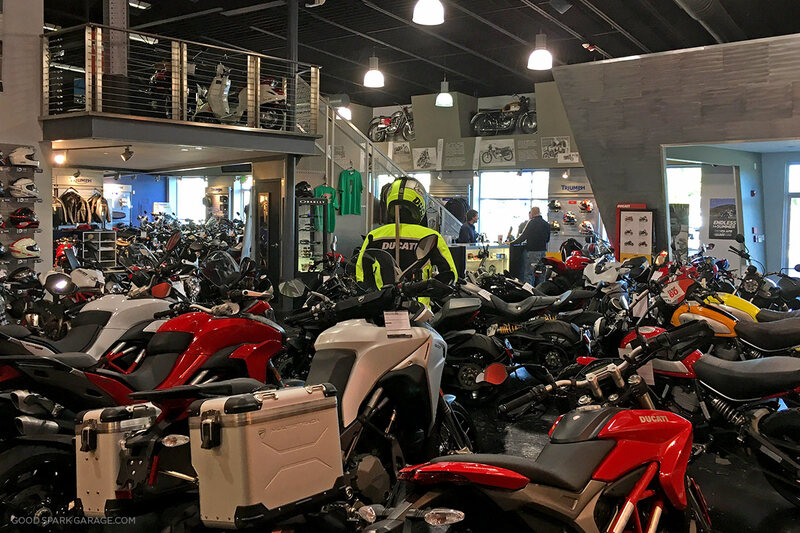 Did we mention that Moto Europa is well-stocked? Check out that inventory. 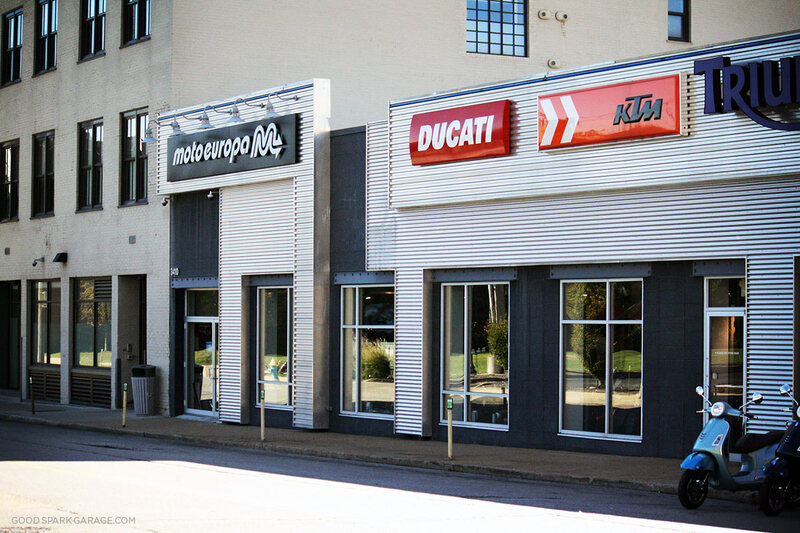 They sell Ducati, Triumph, KTM and Vespa motorcycles along with tons of aftermarket apparel and accessories. 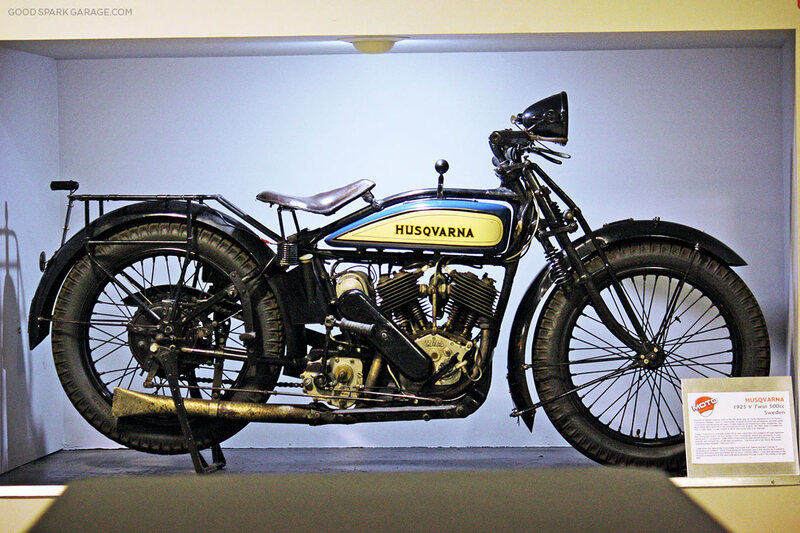 Husqvarna motorcycles date back to 1903, originating in Huskvarna, Sweden. 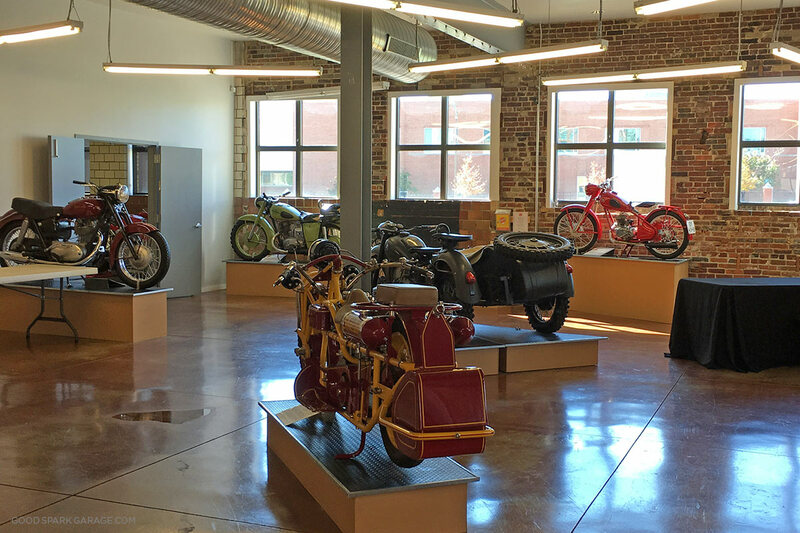 So if you’re in the neighborhood of Grand Center in St. Louis, stop by the Moto Museum, Moto Europa, and Triumph Grill. Make sure the museum is open since they do host private events. I’m sure we’ll be back to visit this moto-complex again! Follow Good Spark Garage on Facebook, Twitter and Instagram.